Once upon a time, not so long ago, I had a bag of toffee bits. Let us not discuss what may have happened to them. Your table plants look beautifully springy, which is just what I am hoping to see a lot of in my wanderings through Blogdom today. The cookies look delicious! Shortbread and toffee are both favorites of mine. Your I love those cookies Kitty and I bet they are yummy! Hope you had a nice St. Patrick's Day. Thanks for sharing at Cooking and Crafting with J & J. Your bunnies are so cute! Next time, I'll try adding toffee bits to my shortbread. What a great idea, Kitty! Oh my, Kitty. Toffee Shortbread - I'll take three please! Love your bunnies, teacup, and flowering basket. I'm not very successful with inside plants. 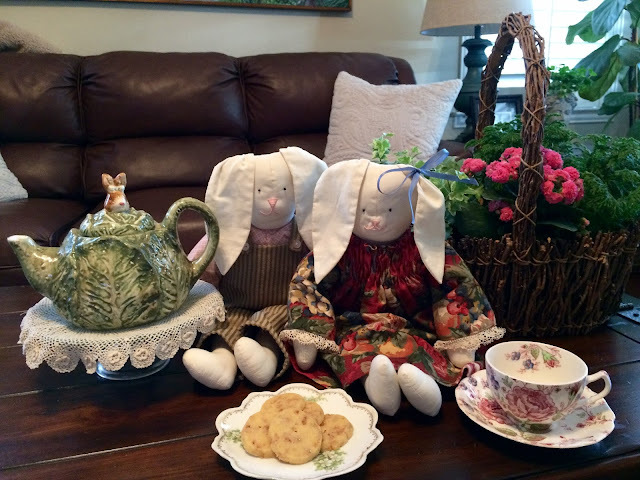 Your handmade bunnies and rabbit teapot are super cute! I've always been a fan of the JB Rose Chintz pattern. Your toffee bit shortbread cookies are perfect for tea time. I've been on a mini-egg craze lately. So far, I've had chocolate mini-egg ice cream and scones. The cookies sound amazing! And, I love your Bunnies! Oh my! I would gobble up these cookies so quickly. I love shortbread...and toffee too. Perfect combo. Love all your pretty plates, cups, bunnies and decor. Happy Easter to you! A perfect tea (or coffee) cookie! Your Tea time is soooo sweet and darling!The bunnies are so cute and I love that pretty and unique teapot too.That teacup is beautiful and it is in my bucket list...Your cookies look yummy and your flower basket is adorable! THose cookie sound yummy, Kitty. I agree with you on the plant looking similar to arborvitae. That cabbage pitcher is adorable and, of course, I love the vintage items in your vignette. I hope your week is a good one. It's Spring - yay! Mmmm... yum, yum, yum! These sound ever so good, my friend! And something my dear hubby would love! Thanks for the delightful post, sweet Kitty. And aren't your bunnies just precious! Hugs to you! Toffee shortbread sounds so delicious. You have such love Easter decorations. Very festive post. Those roses on the tea cup and plate are beautiful. This cup would certainly be my favorite if it were mine. LOVE, love your teapot, your bunnies and your flower basket! And your cookies sound delicious. Anything with toffee catches my eye. Thanks for sharing! Beautiful decorations and teapot! The cookies look amazing - I love toffee in/on anything so definitely saving this recipe! The cookies look delicious -- shortbread and toffee (what's not to love!). And so, too, is your very pretty basket and that teacup. I love Johnson Bros. I don't think they have a pattern I don't like! I love the way shortbread cookies just melt in your mouth... sometimes I don't even bite them but let them just melt away! Your spring tea party with your darling bunnies is just perfection! Kitty, what a lovely treat! And I love that you baked half and froze half. It just makes life easier. Oh I love your cute bunnies! I have on I'll have to find! We are big fams of both toffee and shortbread, so that's a winner! 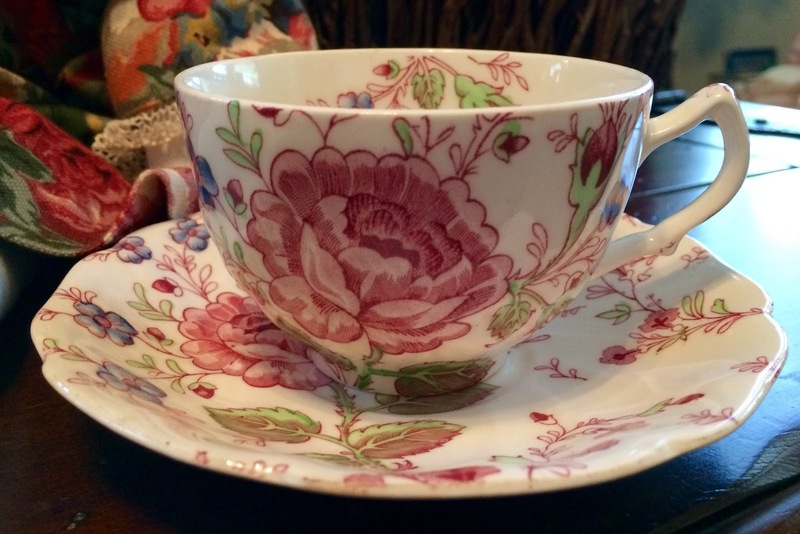 Thanks for linking to Tuesday Cuppa Tea! Hope you are doing good, Mizz Kitty. Thank you for sharing your recipe with us, Kitty, and I hope you have a wonderful weekend! Your bunnies are adorable, they look a lot like mine that I made years ago, wonder if we used the same pattern? Your Toffee Bits Shortbread Cookies will be perfect for afternoon tea! Hope you are having a great weekend and thanks so much for sharing your great post with us at Full Plate Thursday! Those look delicious. I would love to have one right now. Thanks so much for linking up to Keep In Touch. Kitty, you come up with the best recipes. perfect for a snack or dessert. I love toffee. Your bunnies are so adorable. The cabbage teapot is too cute! Always a pleasure to visit. Thanks for sharing your darling post at Dishing It & Digging it. have a lovely week Kitty. 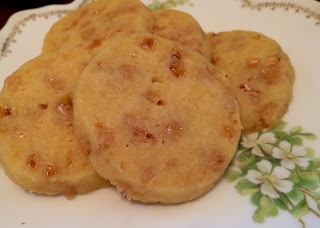 Your shortbread toffee cookies look delicious. Your cabbage tea pot is too cute. 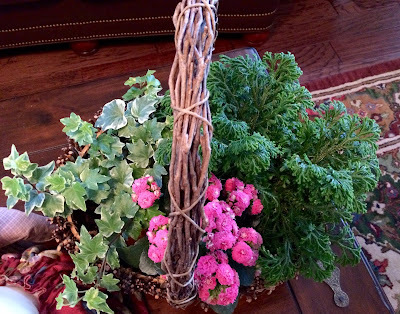 You have styled an adorable Easter vignette. Sorry, I am late to the party. Oh my Kitty! I love shortbread cookies, and I love toffee. These are a win, win for me! Thanks for sharing the recipe with SYC. Sorry I am late commenting - but I must say those shortbread cookies look amazing. I love shortbread - I guess I love everything really and the idea of toffee seems really special. Your bunnies are very darling!